What is the link between food security, gender equality and microfinance? Participants at the EXPO Milan workshop on “Gender, food security & microfinance“, organized by the Fondazioni Pangea Onlus and Un Raggio di Luce Onlus, explored this topic on 13 May 2015. It was the first of a series of five seminars on “Finance for food”, sponsored by the Rete Italiana di Microfinanza RITMI and the Italian Sustainable Investment Forum (FFS). The aim is to identify and highlight the best practices in financing food security and sustainable agriculture, both at national and international level. Panellists at the Finance for Food seminar at Expo 2015. In her opening remarks, Simona Lanzoni, PANGEA’s Vice-President and the moderator of the workshop, emphasized the women - food security nexus. She highlighted the importance of appropriate and context-specific ways to deliver micro-finance services to women so that they can contribute to the food security of poor families. To do so they need to be part of multiple interventions that complement each other. “Is there a social dimension to food security?” Sabrina Aguiari (Tulane University Food Security Summer Studies) demonstrated how the concept of food security has evolved over time, from the World Food Summit 1971 to subsequent food summits in 1996, 2002 and 2009. She dwelt in particular on the four dimensions of food and nutrition security - availability, accessibility, utilization and stability. She also underlined the shift from a focus on the household level to the individual, which helped to highlight the gender differences. Touching also on the right to food and the debate about food sovereignty, Aguiari emphasized the importance of a feminist perspective, in particular when considering women’s invisible and un-counted work in the care economy and in food production. In her view, women’s access to micro-finance should be seen in the context of the four dimensions of food and nutrition security. Each dimension required different financial inputs and services. “Can women have access to productive resources to ensure food security?” That was the opening question of microfinance expert Smita Premchander who shared good practices and challenges from Sampark, a project in Koppal district, North Karnataka (India) of which she is the General Secretary. 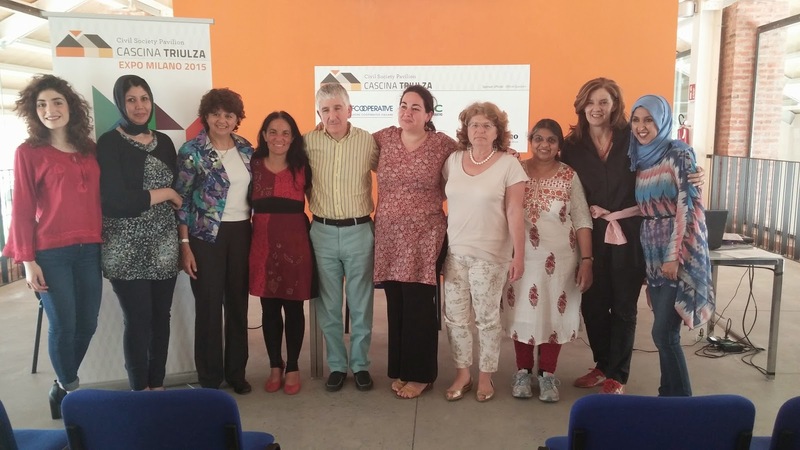 Formal and informal groups as well as individuals started income-generating programmes, established enterprises, and carried out other gender related activities, with the support of Fondazioni Pangea Onlus. Women in 35 villages organized into 160 Self Help Groups (SHGs) and engaged in savings and credit activities. By regrouping 15-20 SHGs into cluster associations, they started to play an important role in designing credit systems, monitoring groups, auditing groups annually and implementing enterprise development activities. Women also registered as cooperatives. Premchander underlined the importance of savings, which enable women not only to hand out small credits to each other but also to take bigger credits on behalf of the clusters and then pass them on to members. 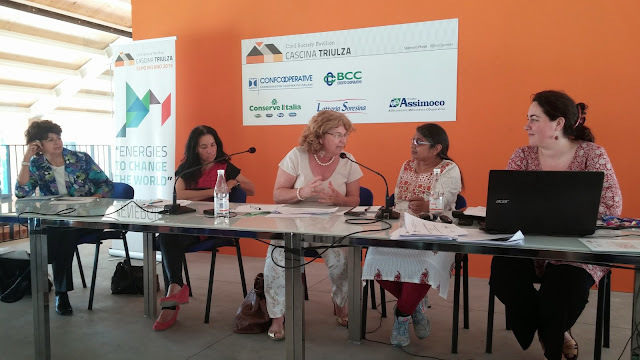 Paola Ciardi, International Consultant and Nepal Country Coordinator for Fondazione Un Raggio di Luce Onlus, reported about a project in Jumla (Nepal) with a focus on microfinance, agricultural development, food security and women’s empowerment. At the request of the community, the project trained female health facilitators, built water mills and restored drinking water systems, to lighten women’s workload. In 2015, a special micro-credit fund for women was introduced. It includes a clause that requires husbands to sign a contract and agree to support women’s greater participation in decision-making. The project also trained 33 community gender facilitators (women and men) who monitor the project and have made commitments to promote gender equality. Participants at the Finance for Food seminar at Expo 2015. In my presentation on rural microfinance and food security, I spoke about IFAD's experiences in empowering rural women through improved access to financial products (savings, loans, insurance, remittances transfers) and improved food security. Women make up a massive 72 per cent of the 19.1 million voluntary savers in IFAD-supported operations. My main message was that access to financial services must be linked to wider sustainable development processes including access to markets, value chain development, gender equality, strengthened local economies and political stability. Overall, the expansion of microfinance since the 1990s has significantly increased women’s access to loans and savings, not only contributing to poverty reduction and financial sustainability, but also to a series of ‘virtuous spirals’. First, increasing women’s access to microfinance services can lead to their economic empowerment enabling them to access significant amounts of money in their own right for the first time. Second, increasing women’s access to microfinance can increase household wellbeing (health, education, happiness). Even where women are not directly engaged in income earning activities, channeling credit or savings options to households through women may enable them to play a more active role in decision-making at household level. Third, a combination of women's increased economic activity and increased decision-making in the household can lead to wider social and political empowerment and gender equality. Rural finance is key for agricultural production and food security, thus improving income, household food consumption and health. Women are important actors in agricultural production and food processing and preparation. Nutrition-sensitive agricultural programmes can channel investments into women-specific activities that have a direct impact on food and nutrition security and generate income at same time. These can include small ruminants, fishponds and aquaculture, horticulture and kitchen gardens and forestry products, just to name a few. Why is financial literacy so important? Financial literacy is more than reading and basic maths. And it’s more than learning about financial products, interest rates and the importance of paying back on time. It is about managing one’s resources, having a vision on where to go and which goals to reach. That’s why the Gender Action Learning System (GALS) is an excellent tool to enable beneficiaries, who often are illiterate, to draw up a vision, set a trajectory and to take one step at a time. How can we reach the very poor and most vulnerable? The Sampark project particularly targeted the poorest women who also have the least capacity to be able to give free time. Therefore, such programmes call for a lot of investments, by NGOs and donors, in terms of trainings and capacity building. At the same time, when resources are scarce, they also call for sacrifices from the women themselves. This means that such programmes need to be long term and well funded, and therefore can be only limited in scale. Matching funds and guarantee schemes are additional means to ensure inclusion of the poor, but always should be accompanied by training and mentoring. Why is women’s empowerment such a long process? In the case of Sampark it took 5-10 years to reach some levels of empowerment, which are different for every woman. The ‘virtuous spirals’ of women and microfinance demonstrate how long it can take to change mentalities and perceptions – of the women themselves, of men, be they husbands, fathers or brothers; of mothers-in law and other relatives who have a say on women’s mobility and actions; of religious and political leaders; and in case of rural finance, of policy makers and stakeholders in public and private sector. Why is the link to food security and nutrition so important? Women farmers and smallholders play a key role in agricultural production through their work on the farm, in the field or in the kitchen gardens. Women are also involved in food storage, processing and preparation. Access to credit or saving schemes, combined with training, can enable women to improve their skills in all sectors related to farming and food processing. Ultimately the greater availability of nutritious food ─ not only staples such as rice, but also vegetables and protein ─ combined with women’s improved knowledge about diets and food preparation will ensure greater food security, better nutrition of the family and reduce child malnutrition. Now to the EXPO. The workshop was held at the Cascina Triulza, a building on the EXPO site which was renovated and especially designed for use by civil society organizations. It took some hurdles to reach it. Although the EXPO had opened 13 days earlier, we were the first customers for our taxi driver to ask for this destination and he promptly left us at the back entrance. 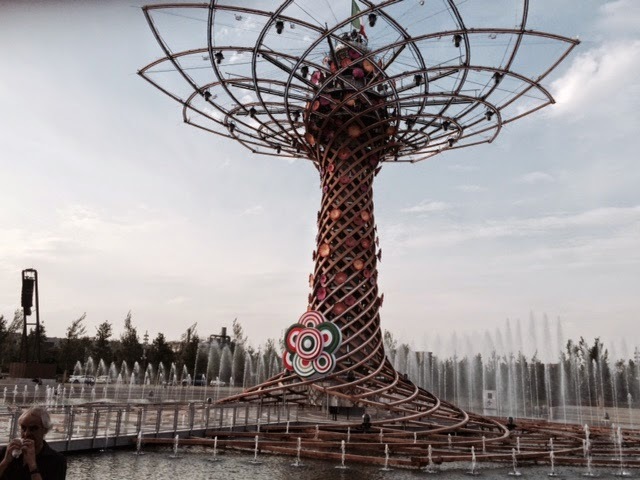 The long walk to Cascina Triulza enabled us to have encounters with huge crowds of school children and visitors and provided a good glimpse of many beautiful national pavilions along the way. There were some challenges. Only a small group, most of them connected to the organizers, had gathered. Some EXPO visitors and school children ventured from time to time into the conference room, listened for a while and left again. Through the open windows, we could hear the truffle sellers go about their business and workers doing last minute work with their drills. In conclusion, it was a pity that the event was not more widely publicized and covered by livestreaming in order to attract a larger audience. Ordinary EXPO visitors seem to have other priorities. Who would pay 36 Euros for a day pass and then sit 3 hours in a workshop when there is so much to see outside, the stunning national pavilions, the enticing food stands, the colorful videos and demonstrations? How many people would venture out from the centre of Milan, spend 30 minutes on subway and walk another 30 minutes to attend a workshop, even when in possession of a free ticket? To attract EXPO visitors, on site events need to be designed differently - short, with infographics or videos, demonstrations or simulation games. For my part, I will definitely go back and visit the EXPO … at leisure!